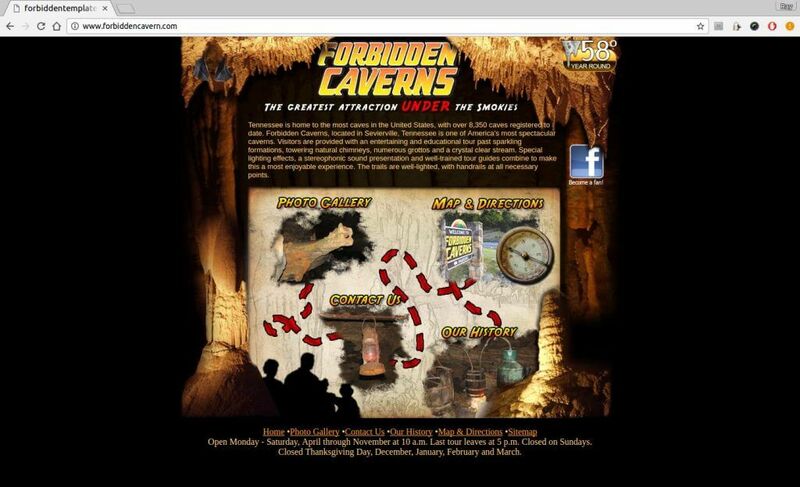 Sevierville Attractions: Forbidden Caverns - Bear Camp Cabin Rentals. Tennessee is home to the most caves in the United States, with over 8,350 caves registered to date. Forbidden Caverns, located in Sevierville, is one of America’s most spectacular caverns. Visitors are provided with an entertaining and educational tour past sparkling formations, towering natural chimneys, numerous grottos and a crystal clear stream. Special lighting effects, a stereophonic sound presentation and well-trained tour guides combine to make this a most enjoyable experience. The trails are well-lighted, with handrails at all necessary points. Hundreds of years ago, Forbidden Caverns was known to the Eastern Woodland Indians who roamed East Tennessee’s forests and mountains in search of good hunting grounds. The cave was used as a shelter in the winter and the cave river provided a constant supply of water. Scientists believe the source of the water to be an underground lake located beneath English Mountain, now famous for it’s spring water. Flint or chert is found here in limited quantities and was used to create arrowheads, knives and scrapers. The cave also contains many unique calcite formations that are still growing and boasts the largest wall of rare cave onyx or dripstones known to exist. An interesting Indian legend explains the fate of an Indian princess who was lost in a “hollow mountain of two streams”…”which is forbidden”. During the early twenties and until 1943, the cave was used to make moonshine. The constant water supply and the isolated location was ideal for Moonshiner’s to make their homemade whiskey. In 1964, a group of business and professional men began the planning and vast undertaking of opening this natural attraction to the public. After 3 years of excavation and development, Forbidden Caverns was opened in June 1967.